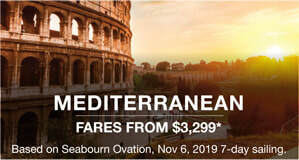 Seabourn Signature Savings 2018 - Fugazi Travel Agency Inc. 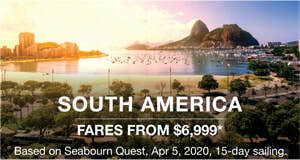 Extraordinary savings on select 2019 sailings during our Signature Savings Event. *Signature Savings offers expire February 19, 2019. Featured fares are per person based on double occupancy and promo NV. 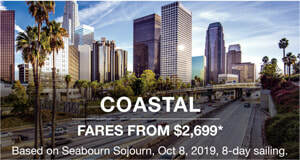 Fares are in U.S. dollars. All savings amounts are included in fares shown. 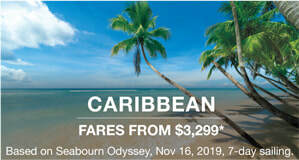 Taxes, Fees & Port Expenses are additional and range from $90 - $2,850. Offers are not combinable with any other discounts and are not transferable or refundable. 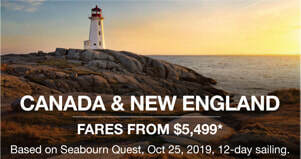 Offers are applicable on select 2019 & 2020 sailings. Complimentary two or three category Veranda Suite upgrade is valid on select sailings and subject to availability at time of booking. Upgrade will be reflected in fare paid for selected Suite category. Combination cruise savings of up to 15% applies when combining consecutive cruises on the same ship and is subject to availability. Reduced deposit offer is valid on select sailings that are outside of penalty periods per policy. 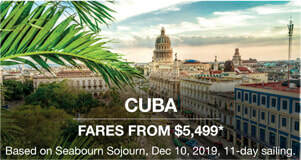 Shipboard credits are available in the following amounts by product: Coastal, Cuba & Mediterranean up to $200USD per Suite ($100USD per person); Canada, Caribbean & Northern Europe up to $300USD per Suite ($150USD per person); Alaska up to $400USD per Suite ($200USD per person); Antarctica, Arabia, Asia, Australia, New Zealand, Panama Canal, South America & South Pacific up to $500USD per Suite ($250USD per person). 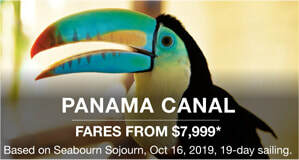 Premium Suite shipboard credit offer of up to $1,000USD per Suite ($500USD per person) is valid on select sailings and is available only in Suite categories PH, PS, OW, SS, WG and GR. All shipboard credit offers are in U.S. dollars and are non-refundable, non-transferable, have no cash value, expire at the end of the cruise, may not be used in the casino and are not combinable with any other shipboard credit offer. Shipboard credits are based on promo ZC. Complimentary Internet Package includes 300 minutes of internet access per guest for 1st & 2nd guest booking in Ocean View and Veranda Suites. Unlimited Internet Package is offered on a per Suite basis and only in Suite categories PH, PS, OW, SS, WG & GR. Internet service is not guaranteed. Seabourn is not responsible if internet service is unavailable. No credit or other compensation will be provided should internet service not be available. Internet Packages are based on promo ZI. 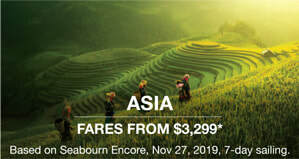 Air credit is available for round-trip flights booked through Seabourn’s Flight Ease® program. Air credit is available to guests 1 & 2 sharing a Suite, is non-transferable, and is not combinable with any other fares. Certain restrictions may apply. Seats are limited and may not be available on every flight. Air fares include one complimentary checked bag, additional fees for baggage and other charges may be directly assessed by airlines or airports; please refer to the applicable airline website for further information. Air must be booked no less than 30 days prior to voyage sail date in order to be eligible for the air credit. Air Credit is based on promo JX. Shipboard Credits, Internet Packages and Air Credits are not combinable with any other offers. All offers are capacity controlled and may be modified or withdrawn at any time without prior notice. Other restrictions may apply. Seabourn reserves the right to correct errors. Ships’ registry: Bahamas. 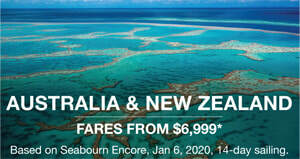 ©2018 Seabourn.